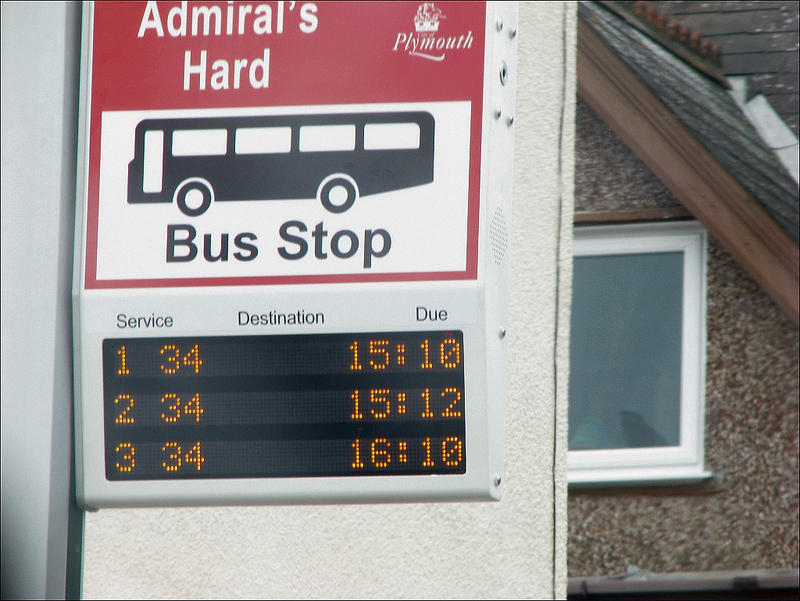 "How many bus stops in Plymouth are actually fitted out with some form of Real Time Display?" I must admit I was disappointed at just how low this figure is. Perhaps I was taken in by the promise of a real time information system that would let you know when the next bus was due to arrive. I expected that this display would not be at all the bus stops, but it still seems a very low number. None of the bus stops around our way have any form of RTP. I know there is the sms text service but it still seems that very few bus stops give any indication of the bus stop code needed. Even Derriford Hospital has still not got a working display (unless it has been switched on this last few days)and that is the second busiest bus stop after the City Centre. I just cant help get the feeling that it is all a bit of a disappointment. Has it really been as long as that? I guessed about five or six years? This is a subject I will be coming back to, once I gather some more information! I'm not familiar with the Plymouth system but it seems to me that if the stops only ever show the time the bus is due along with the word "due" it doesn't appear very "real time" even if it is - it looks like (only) a fancy electronic timetable. There are better systems such as in Brighton where the stops show how many minutes until each bus will actually arrive (along with normal paper timetable displays at the stops too). The system works and has been running there for many years. Perhaps it's easier with just one operator?! At Least you in Plymouth have some, we in Manchester have none!!!! The information is at basic level useless apart from being as mentioned an electronic timetable. Only a handful of routes will countdown the number of minutes, some show "due", some will show "delay" (delay of what?? ), others the time and disappear after the set departure. And don't get started on "no buses for 1 hour"! The SMS system is worse, that only gives you the next timetabled bus.